Tags: Andrew Hinrichsen, Aussie Millions, Bryn Kenney, Mike Del Vecchio. An American poker pro outlasted a record player field of 822 to win the top prize worth AU$1,272,598 (approx. $923,269) in the 2019 Aussie Millions Main Event. The first weekend of February 2019 is definitely a memorable one for a handful of players who reached the final table of the Aussie Millions AU$10,600 NLHE Main Event. A whopping 822 players entered the poker arena set inside Melbourne's Crown Casino (which surpassed the previous record of 800 entrants back in 2018), and this number makes it the single biggest Aussie Millions Main Event field in poker history. The huge turnout generated a prize pool worth AU$8,220,000 (approx. US$5,984,493). After five grueling days of poker action, it was 32-year-old Bryn Kenney who secured the title and the pot worth AU$1,272,598 (US$923,269). The American poker pro currently has live tourney wins of over $26.6 million, sending him to 9th place in the All Time Money List. It wasn't a walk in the park for Kenney, since he entered the final day of the event as the shortest stack amongst the seven players left in the final table. He just had less than 20 big blinds when the final day started, but he managed to climbed back up steadily. When it was down to three players left, Andrew Hinrichsen, Mike Del Vecchio and Bryn Kenney decided to make a deal based on ICM numbers. In the end, the three settled for Kenney getting the biggest payout of AU$1,272,598 and the title, whereas Del Vecchio got 2nd place for AU$1,272,162, and finally Andrew Hinrichsen settled with the 3rd spot for AU$1,097,739. Bryn Kenney said after he won, "I've had bigger wins than this. But it's amazing to do it in this city. I've been having a good time with these people. It's by far the most I've ever been asked to take a picture. During the whole tournament every time I'm on a break maybe 2-3 people want to take a picture. That's how poker should be, watching and having a good time." "It's the best tournament stop in the world. During the summer here you just walk outside on break and it's just nice here. I don't have a complaint about it so I'd recommend anyone to come here next year - every year! It's just a great stop!" 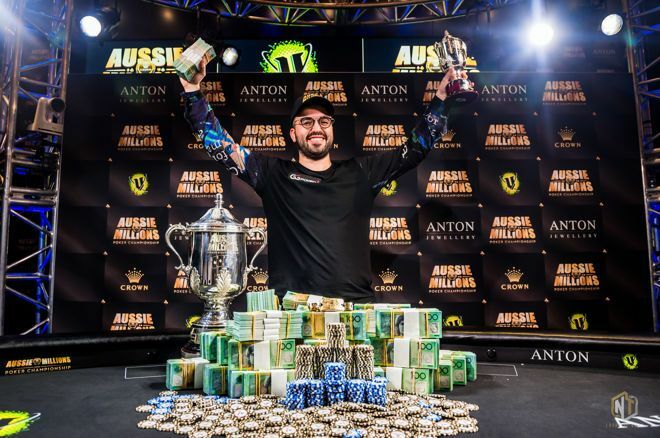 6 comments for "2019 Aussie Millions Main Event won by Bryn Kenney for AU$1,272,598"
first place being almost 1 million USD, from a ling lasting tournament. 822 entries in a tournament with a buy-in of AU$ 10.600 is a success for the organizers, from my point of view, especially as this game was not in Sua. Australian players are active in this final table with 3 players who have made a very good game each. 2 Americans occupied the first two positions but no European in the first 7 places paid. However, this tournament was very hard, if it is over after 5 days. this is something that more players can play it,even its still big buy in for most of poker players!on this kind of event you can come with satellite maybe,then to have more for direct buy in! good number of players and great prize for winner,almost 1,3 million! Congratulations to Bryn Kenney for being crowned champion of the 2019 Aussie Millions Main Event! I am sure that his next accomplishment is right around the corner. Wishing him all the very best for each and every one of his future endeavors.